606 place | Vector illustration in rank M-rank: Christmas Santa Claus Hats With Fur Set. New Year Red Hat Isolated on White Background. Winter Cap. Vector illustration. 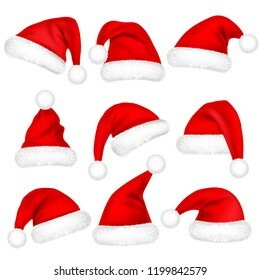 Christmas Santa Claus Hats With Fur Set. New Year Red Hat Isolated on White Background. Winter Cap. Vector illustration.